In November of 2016, Brazilian underdogs Chapecoense boarded a plane to play in the game of their lives. Instead, their biggest moment turned into a tragedy no one can forget. 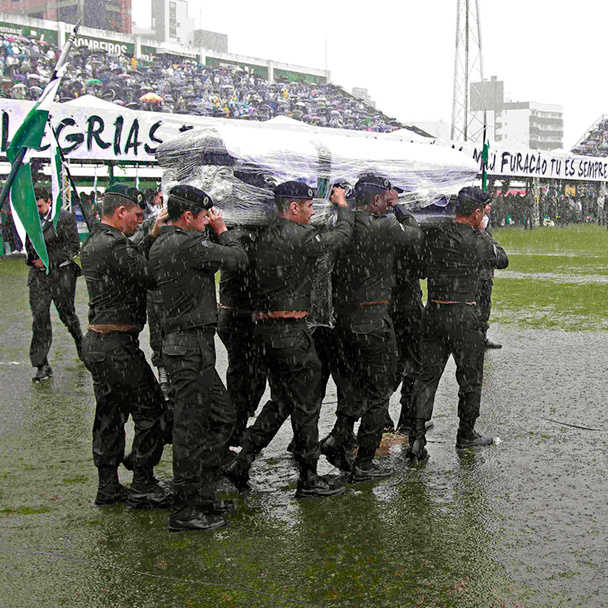 by Sam BordenEPA/FERNANDO BIZERRA JR.
Editor's note: On the two-year anniversary of the Chapecoense tragedy, ESPN is reposting the article, along with an extended epilogue below that offers updates on what has happened to the main characters in the story during the days, weeks and months since the club, and its city, was stricken by a shocking -- and seemingly preventable -- tragedy. There is rain in Chiquinho's pockets. Rain running down his shoulders. Rain squishing through his shoes. The rain is so loud he barely hears the music. The rain is so thick he barely sees the coffins. Chiquinho tries to focus. He has a job. He is the groundskeeper. He takes care of the undersoil and the topsoil. He takes care of the field. This stadium is his home. The members of the club are his friends. One of the goalkeepers, Danilo, used to joke with Chiquinho about the bare patch down at the end of the field. All that mowing and feeding and watering in the warm Brazilian sun, and Chiquinho still couldn't get grass to grow there. "Where is the grass?" Danilo would ask with a sparkle in his eyes, and Chiquinho's leathery face would crinkle. One of the team's trainers, Anderson Paixão, used to talk with Chiquinho about the stray dog Chiquinho found lying outside the gates one morning a few years back. The dog was hurt and whimpering -- a boy nearby said he thought it might have been hit by a car -- and Chiquinho and his crew took it in. They gave the dog dried meat and bought it medicine. They rubbed its belly and cleaned its black fur. They got it a leash and built it a tiny house out near the shed with the rakes. They named it Pitico, which is Portuguese for "something little." Before training, Paixão would pet Pitico and wrestle Pitico and kick soccer balls for Pitico, like a game of fetch, except Pitico would skip right past the balls because he was more interested in chasing the birds swooping low near the sidewalls. Pitico would nuzzle Paixão, and Paixão would giggle, and Chiquinho, watching from the side, would take pictures on his phone that he could look at during his long bus ride home every night around dusk. Chiquinho took pictures of the players before each game, too. But now Pitico is missing. And Paixão, Chiquinho's friend, is in a box coming toward him, and Danilo is in one, too, and the water that has been running off Chiquinho's neck all day is suddenly rising through the grass on the field like a bathtub with the stopper dropped in. Big puddles are forming, and water is splashing everywhere, and Chiquinho the groundskeeper is scared. 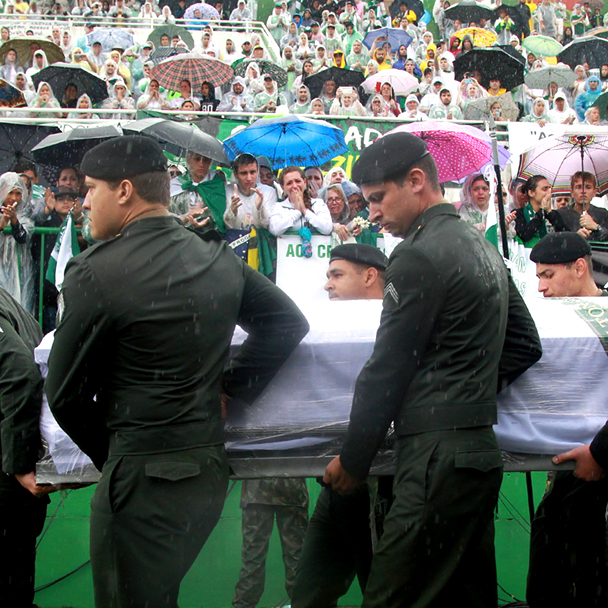 There are tens of thousands of people watching Brazilian servicemen carry in one coffin after another. The coffins are heavy. What if a soldier carrying Danilo or Paixão slips? What if a coffin gets covered in mud? Chiquinho cannot allow this. There are 50 coffins today. Fifty. And it is Chiquinho's field. He even laid out the floral wreaths and tied the bunting through the holes in the metal fences. He doesn't know anything about flowers or colors or bunting, but he wanted to make it nice. He wanted it to be respectful. He knows the coffins must stay dry. He has to fix the flooding. As the processional continues, he runs toward the end of the stadium. There must be a blockage. One of the drain pipes again. He bows his shoulders and slides into the concrete bunker under the stands where all the pipes snake together. It is quiet in there: Nothing is draining. Chiquinho bangs on a pipe, testing to see if he can hear which valve is stopped up. He bangs on another and another, twisting and whirling around to test as many as he can. He can't figure out which one is jammed. He slams the pipes with his hand. His cheeks are wet. He has no choice. Chiquinho takes a saw and begins hacking. He cuts through one pipe and a second and a third, destroying the drainage system. He cuts another pipe. And another. And another. His blade flails in all directions. Finally, Chiquinho cuts the right pipe. Gunky water gushes everywhere. His pants and shirt are sopping. Chiquinho stumbles out of the bunker and back onto the field. The pooling in the grass begins to ebb. He exhales. Then he straightens up and stands at attention, clutching the saw in his fist. He stares as the rest of the coffins are carried in. Everyone else in the arena watches, too. Some watch the military men. Some watch the widows or the mothers or the fathers who scream and hold each other through plastic ponchos. 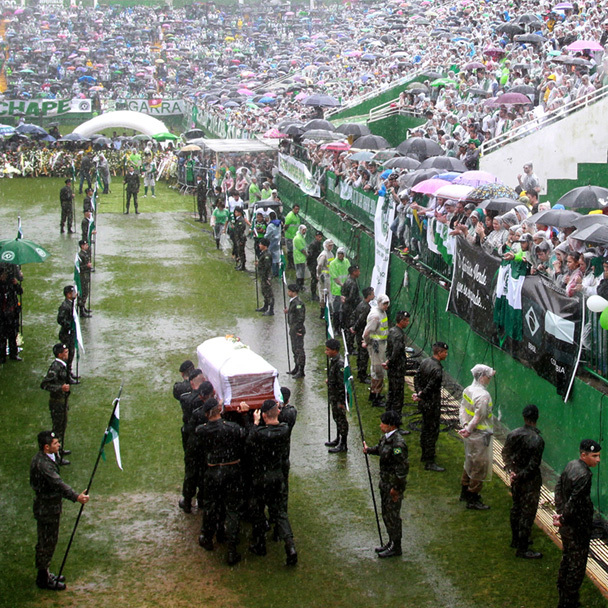 Some watch the children, who fidget and fuss and might or might not understand exactly why an entire city in the interior of Brazil has come together at a soccer stadium to mourn in the rain. Chiquinho just watches all the feet. He cannot help it. He is praying no one slips. It is Nov. 23, 2016 -- 10 days earlier. It is hot and dry. The winds are calm. The sunlight glints off the stained glass of the Santo Antonio Cathedral that sits up high on one of the hills. The rain feels far away. As afternoon shades toward evening, the people of Chapecó crowd the streets wearing green and white. Vendors set up carts selling water and beer. Fans park their cars and lean against the open trunks. More than 800 miles southwest of Rio de Janeiro, this dusty city known for its slaughterhouses and its farmland is preparing for the most important soccer game in its history. Inside the stadium, Chiquinho waters the grass constantly in temperatures that rise toward 90 degrees. Down the street, at the Hotel Bertaso, the players of Chapecoense, which everyone just shortens to Chape (CHAH-pay), compose themselves. Before every home game, the players spend the night in this hotel together in "concentration." They go over tactics and scouting. They talk about formations and strategy. Then, when they are done with all that, they pass the time. The hotel gives the team the entire second floor, and the players spread out. Danilo, the goalkeeper with the kind eyes, is chatty. Kempes, the striker with the frizzy Afro, plays his pandeiro, which is a tambourine. Tiaguinho, a young winger with a dimple, cannot put down his phone. The mood is buoyant. The game tonight is against San Lorenzo, a team from Argentina, and it is the second leg of a two-match semifinal in the Copa Sudamericana, the South American Cup. In the first match of the aggregate series, in Buenos Aires, the teams tied 1-1. Tonight, all Chape needs to do is tie 0-0 because the tiebreaker in this tournament is goals scored in the opponent's stadium. If Chape advances, it will go to the final of one of the continent's most important tournaments. For a team from a city like Chapecó, a team that was founded in 1973 and was in the lowest division in Brazil as recently as 2009, it is fantasy. E:60 showcases the best in longform television journalism, including Setenta Sete, a one-hour documentary on the Chapecoense tragedy. The episode airs Tuesday at 9 a.m. ET and 11 p.m. ET on ESPNEWS. The players get ready to leave for the stadium, but Tiaguinho cannot stop texting his wife, Graziele. She is only 19, but they grew up in the same town and have been in love for years, ever since the day Tiaguinho sat next to her on a bench in grade school and showed her his arm. He had written her name on it in marker, over and over from elbow to wrist. He said, "See how much I like you?" and she laughed. A day earlier, not long after the players arrived at the hotel to begin concentration, Tiaguinho was sitting in the hall outside his room. Two teammates, Matheus Biteco and Caramelo, approached him. "We have a present for you," they told him, and Biteco gave him a gift bag. Tiaguinho took the bag and looked up at them, wary. "It is from a female fan who likes you," Biteco said, and Tiaguinho dropped the bag like it was on fire. He did not want his friends to see him interested in anyone but Graziele. "Just open it, man," Caramelo said, nudging it back, and Tiaguinho grudgingly pulled out a tiny box with a shiny ribbon and card. His eyes went wide. It was from Graziele. Tiaguinho furrowed his brow. He opened the card and read it slowly, tracing his finger over some of the words. Then he closed it, took a deep breath and opened it again. Biteco leaned in, hovering over his friend, and Tiaguinho shot up from the floor, shouting and dancing and hugging everyone around him. He showed them what was inside the box: tiny shoes. Then he rocked an imaginary baby in his arms while his teammates howled. Since that moment, Tiaguinho has been floating. Even now, just hours before this match against San Lorenzo, he is texting Graziele about names. They both like Maite for a girl; it means "beloved." For a boy, Tiaguino pushes for Santiago, which is a family name. Finally, his teammates tell him it is time to go. He cannot resist and texts once more, telling Graziele that he loves her. The game begins around 7. Arena Condá thrums. The fans chant and cheer and sing, standing together on the concrete bleachers or crowding up against the fence that separates the walkway from the team benches. In the press box, Chape's radio play-by-play announcer, Rafael Henzel, holds up his phone to take a video of the energy just before kickoff even as he narrates the action live. Rafael is 43, with a flat face and thin hair and glasses. He works with several other announcers, including his partner, Renan Agnolin, but he is the team's voice. He has been coming to Chape games since he was a little boy. As a child, he would arrive at the arena with no money and wait outside the gates. Once everyone had gone in and the game started, he could find an entrance that was unattended and slip in for free. He cheered for the team when it was still playing in the amateur leagues. He became a broadcaster when he was 15. When Chape finally reached Brazil's top division in 2013, he cried in his radio booth. Tonight, with a place in the final at stake, Rafael is even more dynamic than usual. The Chape players know what they have to do: just avoid conceding a goal. They do not need to score, and San Lorenzo's players are more talented anyway. San Lorenzo has three players who played in England's Premier League. It has a regular for Argentina's national team. It has players who play for Uruguay and Paraguay. Chape has only the one away goal it scored in the first game that it wants to protect. After the first 15 minutes, the Chape players -- and the crowd -- grow more confident. Danilo dives to his left to push away a shot, and the fans erupt. Dener, a midfielder, flicks the ball over his head to elude an opponent, and the spectators shout a mocking "oh!" as the San Lorenzo player gives chase. Chape occasionally presses forward in attack, and there is one sequence, about half an hour into the game, when Chape nearly scores. A free kick comes in, and Willian Thiego, a stout central defender, lashes the ball into the goal. He turns away to celebrate, wanting desperately to share the emotion with his teammates on the bench. He does not see the offside flag raised. When he does, he stops his gyrations midjiggle, shakes his head and runs back up the field. Mostly, Chape just defends. A San Lorenzo player's header hits the post and bounces out. Danilo slides out quickly to block a shot. A long-range blast goes wide. The minutes creep by. Seventy. Eighty. Eighty-five. Eighty-eight. Eighty-nine. It is still 0-0. The fans are frothing as it appears Chape will do it. The stadium is shaking. With seconds left in injury time, San Lorenzo gets a free kick and lofts the ball toward Chape's goal. Even with all the defenders there, it ricochets around and falls at the feet of Marcos Angeleri, an experienced Argentine. Angeleri is directly in front of the goal, 18 feet away. All he has to do is shoot the ball into the net, which is 24 feet wide, and San Lorenzo will steal the game, go to the final and keep Chape home. Danilo, the goalkeeper, looks helpless. Rafael, in the radio booth, puts his hands to his head. He fears the worst: At the last breath, Chape will lose. But as Angeleri prepares to shoot, Danilo rises up like a lion on its back legs. And somehow, with his right foot splayed sideways, he blocks Angeleri's blast from close range. For a beat, it is as if the fans cannot fathom what has happened. But then the roar is long and loud, and Danilo thumps his chest with glee. Rafael, in his radio booth, calls out Danilo's name, over and over. Except he changes it. Instead of saying "Danilo!" he wails, "Deus-nilo! Deus-nilo! Deus-nilo!" When the referee blows the whistle to end the game and officially send Chape to the final, he bellows it once more. "Deus-nilo! Deus-nilo! Deus-nilo!" In Portuguese, "Deus" is the word for God. The celebration begins in the hot and sticky locker room. The players form a circle and scream out the team song, the one the fans sing whenever something good happens or something bad happens or, really, anything happens: "Ohhhhhh! Vamos-vamos-Cha-pay! Vamos-vamos-Cha-pay! Vamos-Vamos-Cha-paaaa-Aay!" They are delirious. Ananias, an attacking midfielder, jumps up and down on the seat in front of his cubby. Bruno Rangel, the team's leading scorer, is shirtless and claps his hands over his head. Sérgio Manoel, one of the only players still wearing his full uniform, dances through the middle of it all. Jackson Follmann, the backup goalkeeper, bangs his hands against the frame of his locker. Even the mayor of Chapecó, Luciano Buligon, holds a paper cup and shouts along. The party moves to Spettus, a restaurant in town where the team often goes. Paixão, the trainer, has a cavaquinho, or a four-string guitar. William Thiego has a surdo, which is a large Brazilian bass drum. Waiters circulate, cutting thick slices of sirloin from towering skewers. The players relive the match. There is a toast to Danilo for his miraculous save. The wives and girlfriends sit together and talk about how they have never seen their men like this. The women of Chape are close. The men are always playing or training or in concentration before they play again, so genuine friendships among the women are natural. When Graziele received the results of her pregnancy test -- before she surprised Tiaguinho with the news -- she went with Geisa, who is Caramelo's wife, and Val, who is married to the defensive midfielder Gil. They had not known each other long, but when the results came back positive, the women hugged Graziele and congratulated her and told her she was so young to be having a baby. At Spettus, the women talk about the future. About the championship game, yes, but only a little bit. They talk about Graziele's baby and about a trip that many of the families are planning to take to the Dominican Republic after the season. They talk about bathing suits and how they will go to the beach together. They talk about relaxing. Aline Machado joins in but cannot stop looking at her husband, Filipe. He has never been this happy, not when he was playing in Iran or the Middle East or for other clubs in Brazil. Not even when he was making good money. "He looks fulfilled," she says to one of her friends. Over the next few days, nothing changes. In the morning, Filipe leaves a love note for Aline on a napkin in the kitchen. When he begins packing for the trip to São Paulo, where Chape will play a Brazilian league game and then, from there, go to Medellín, Colombia, for the first leg of the Copa Sudamericana final, Filipe puts their 2-year-old daughter, Antonella, up on top of the suitcase as he wheels it around the apartment. Antonella squeals and grabs her father's arms. Filipe and Aline talk about the team and the winning and the trip to the Dominican Republic and about Antonella's love of the problem-solving dogs on the TV cartoon "Paw Patrol." As Filipe is about to leave, Aline kisses him and tells him, "Go now, go and take this moment." At Tiaguinho and Graziele's apartment, Tiaguinho puts his bag down by the door and caresses Graziele's belly. At their wedding, she wore a sleek white gown with a floor-length veil and a headband with crystal butterflies on it and looked like a princess. Now, she tells him she hopes she will start having strange cravings soon, like pickles or sausage, instead of just feeling nauseous all the time. He hugs her and talks to the baby, telling it he is going to teach it how to play soccer and take it onto the field with him before a big game someday. Tiaguinho nuzzles Graziele's stomach before he walks out the door and says, "Love, take care of our little baby." Alan Ruschel, a left back for Chape, has a more frenetic departure. A misplaced passport leaves him and his fiancée, Marina, scrambling, and Marina is worried it is some sort of sign, a harbinger about her fiancé's chance to play well in an important final. But the passport is found, and Alan can leave, and Marina feels an exaggerated sensation of comfort and calm come over her when she is in the shower the next morning. It is an unusual feeling for her; she likes energy and pace. She was in beauty pageants when she was younger and sometimes wears a nose ring and highlights her hair lighter or darker depending on her particular mood. She is working on designing her own clothing line and likes walking the couple's dog, even though the dog has an affinity for chewing everything from shoes to furniture. She is not used to serenity. She tells Alan about this feeling, and he chuckles at her. "What do you think it means?" he asks, and she hesitates. She cannot place the sensation; she only knows it makes her feel warm. "I think something very good is going to happen to you," she says finally. "I think maybe you are going to score a goal." The flight to Medellín takes off at 6:18 p.m. local time. It is delayed slightly because one of the players asks, just as the doors are closing, whether he can get his bag back from the luggage hold. He left his video-game player inside. Many jokes are made, but the bag is retrieved. It is retrieved because this is a charter flight operated by LaMia airlines and not a regular commercial flight. LaMia is a Bolivian company that has flown many other soccer clubs to important games. Just a few weeks ago, on the same plane, it flew Lionel Messi and the Argentine national team to a World Cup qualifier. A Bolivian airline cannot legally operate a flight from Brazil to Colombia, so the Chape traveling party first takes a commercial flight from São Paulo (where the team loses 1-0 to Palmieras in that Brazilian league game) to Santa Cruz de la Sierra, a Bolivian town. LaMia will then take the team from there to Medellín for the first match of the Copa Sudamericana final against Atlético Nacional. While waiting for the flight, Alan Ruschel does magic tricks. He correctly guesses which card a teammate picks from the deck and makes a card disappear right in front of everyone's eyes. Danilo tries some tricks, too, but he is better as a member of the audience because he gets visibly startled when Alan suddenly makes the card appear again. Everyone is giddy. A Bolivian television crew does interviews before departure, and one of the flight crew members says to the camera, "I think we'll return with good results." Kempes, the striker, gestures to the crew member and grins, saying, "Everything is fine, because he is in charge." The team used LaMia for a trip earlier in the Copa Sudamericana, and Caio Júnior, the head coach, tells the interviewer that traveling via Bolivia "gives us good luck." Once in the air, the players deal cards and play Samba. One of the staff members tries to teach a flight attendant Portuguese. Caio Júnior sits up front with most of the coaches. Kempes sits on the right side by a window. Two rows from the back, Rafael Henzel sits in a middle seat among the other journalists. Alan sits next to Follmann, the backup goalkeeper, in the center of the plane; Alan was originally in the rear but moved up when the journalists gathered there. Follmann grabbed him and pulled him into his row. The flight is long. Some players eat. Some doze. Some keep their headphones on the entire time. At about 9:30 p.m. local time, the plane begins its descent. A different aircraft, flying from Bogota to San Andres, has just been diverted to Medellín because of a mechanical issue, so Chape's flight is directed into a holding pattern. At 9:49 p.m., the pilot on Chape's flight requests priority to land from the air traffic controller. In the cabin, Rafael asks a flight attendant when they will be on the ground. Ten minutes. Ten minutes, he is told. He notices the flight attendant looks worried. At 9:52 p.m., the air traffic controller tells the pilot there is another plane also holding just below them and asks whether they can wait a few more minutes for clearance. At 9:53 p.m., one of the four engines on the British-made Avro RJ85 plane fails. Thirteen seconds later, the second engine fails. At 9:55 p.m., the third engine fails. Fourteen seconds after that, the fourth engine fails. The lights in the cabin go out, and the air circulator goes quiet. There is no turbulence or shaking; it feels instead as if the plane is floating toward the ground. Using the standard phonetic alphabet to refer to LaMia's call letters of LMI, the pilot shouts into his radio at the female air traffic controller: "Señorita, Lima Mike India 2933 is in total failure!" About 30 seconds later, the pilot calls again: "Lima Mike India, vectors! Vectors, señorita! Vectors to the runway!" He is asking for directions. The controller answers that the plane has disappeared from her radar. She tries to guide the pilot toward the runway anyway and asks for the plane's altitude. The pilot shouts, "9,000 feet, señorita. Vectors, vectors!" The controller tells the pilot how far the plane is from the runway. There is a pause. Then the controller hears the word, "Jesus," over the radio. She asks again for the pilot to call his altitude, and the radio is silent. At 9:59 p.m. local time on Nov. 28, the Chape flight, traveling at about 150 miles per hour, crashes into Cerro Gordo, a mountain with an elevation of 8,500 feet. On impact, the plane shears into two pieces. The tail embeds on the south side of the crest. The nose shoots over the edge and finishes on the north side, nearly 500 feet away. One of the engines catches in the branches of an uprooted tree. There is no explosion, no fire at the site; only twisted metal and debris. The temperature at Cerro Gordo is 66 degrees. There are cloudy skies and thunder in the distance. It is, by most measures, an unremarkable night in Colombia. After traveling four hours and roughly 1,800 miles, Chape's plane plunges to the ground just 11 miles from the runway at José María Córdova International Airport outside Medellín. Aline Machado is sleeping, but it is the sleep of a parent with a toddler nearby. When the phone rings in the early morning, she answers it immediately. It is her mother. At first, Aline does not understand what her mother is saying. Then she hears the words "airplane" and "Chape." Her head starts pounding. She sits up in bed and turns on the television. There are confusing reports about something happening. She feels sick. She calls Antonella's nanny to come over so she won't be alone. The text-message group of Chape wives and girlfriends buzzes on her phone over and over. No one knows what is going on. No one knows what to believe. One woman says that someone from Colombia has messaged her on Facebook but that she is not sure if it is reliable. The person says there are no fatalities, that it was just an emergency landing. There is hope. The television and radio voices keep talking but not saying anything for certain. Then the reports begin mentioning "some" survivors, and the phone buzzes more. Aline believes Filipe is alive. She believes she can feel him. She has known Filipe since they were children. On their first date, he took her to see pigs. Some of her friends thought it was strange, but she understood. The pigs were at a farm his family owned on the outskirts of Gravataí, near Porto Alegre. Filipe imagined that someday he would turn the farm into a soccer field for the community. He would build the locker rooms himself. He would put up goals and children would come and play. He would run camps and clinics. It would be his to share. So on that first date, when they were just teenagers, Filipe was showing Aline his dream. She felt his passion, his ambition that day. She felt his enthusiasm. And now, in the middle of the night, she still feels it. When the TV says a defender is among the survivors, she is sure it is Filipe. She is sure of it. When the TV says it is Neto, she is happy, because it means one of Filipe's friends survived, too. She goes to Rosangela's house. Rosangela is married to Cléber Santana, the captain of the team. Filipe and Cléber Santana are close; when Cléber Santana was substituted late in the game against São Paulo, Filipe took the captain's armband and finished the game as the team's leader. Aline is going to pick up Rosangela, and the two of them will go to the stadium together to wait for more news with the other wives. When Aline comes into Rosangela's living room, the TV is on. Rosangela is sitting there. Aline looks at her and then looks at the TV and hears the reporter say, "There are no more survivors." She stares at the TV for a beat or two or three. Then Aline wails and collapses to the ground. After 20 minutes, Aline and Rosangela collect themselves and go to the stadium. They sit in the locker room with wives and girlfriends and mothers and fathers. Everyone connected to the club has come to the stadium, because no one knows where else to go. Even Chiquinho is there. Graziele is hysterical. Someone says, "Be strong, Grazi, for the baby." A locker room attendant begins to gather the players' clothing, putting things in bags. In one corner is Marina. She feels torn. Jacqueline, Val, Susanna, Aline, Rosangela -- they are all crying. Marina is crying, too, but her fiancé, Alan Ruschel, is alive. The team doctor took Marina aside and told her Alan was in surgery in Colombia. She does not know the details of the surgery, but she knows Alan is alive. She tries to comfort her friends, to hold them and hug them, but they know her partner is not dead like theirs. They know she is not left alone, and, already, it is different. When the man collecting clothes from the lockers comes around to Alan's, Marina stops him. He seems confused. She looks around and tries to whisper. "No," she says under her breath. "No. Don't take these." Rafael Henzel does not know what happened. He does not know where he is, exactly. But he sees lights moving and hears strange voices and tries to call out. "I'm here!" he shouts. "I'm here!" He calls out for his radio colleague, his friend. "Renan? Renan?" Renan Agnolin, his partner, was sitting next to him on the plane. But Rafael cannot see him anymore. He calls Renan's name again and again, but there is no answer. Slowly, Rafael begins to realize there are trees around him. Then he sees faces. There are five or six men. There is a woman. They are talking to him and pulling at his clothes. He yells at them, "Don't rip my shirt! Don't cut my trousers!" He is worried he will lose the only change of clothes he has in Colombia. They tell him he is going to be OK, that they are going to help him. One keeps shouting, "Don't go to sleep, Rafa! Don't go to sleep!" Rafael does not know he was in the back piece of the plane, the one that plugged in the soft earth on the near side of the mountain. He does not know that the elevation and the fog and the mud made it impossible for helicopters to land at the crash site, and that it took hours before rescue workers could arrive. He does not know that he will be extracted from the site in the back of a pickup truck because ambulances cannot get to him. Once he reaches the hospital, he has a vague understanding of what has happened but knows no specifics. He knows the plane crashed, but the doctors do not tell him how many people are dead. He does not know that Alan Ruschel kept asking the doctors, "Where are my friends?" as he was wheeled into surgery. He does not know that Follmann, the backup goalkeeper, will have his leg amputated below the knee or that one physician will describe Neto to a television station as "currently" alive, because he does not want to be presumptuous. Rafael does not know that Danilo survived the crash and was rescued, only to die at the hospital. A day later, Rafael's wife arrives and traces her finger over his face, where a tree branch or a piece of wreckage has gouged a wound above his right eye. He has a swollen abdomen from his seven broken ribs and a tube down his throat and is sedated. She looks at him and says, "I came to get you," and his eyes grow moist. She wants Rafael to focus on himself, on his own recovery, so she and the doctors tell him the story in stages. Three days after the crash, Rafael learns that there are only a few survivors. No one tells him about exactly how the plane went down. No one tells him that there are so many coffins in the San Vicente funeral home in Medellín that they have to be kept in the parking garage because there is no room inside. No one tells him that two days of school have been canceled in Chapecó and that residents are holding vigils all day at the stadium and that children have written cards and drawn pictures that are piling up outside the gates. No one tells him the city is in mourning. On Saturday, five days after the crash, Rafael finally looks at the list, finally reads all the names. 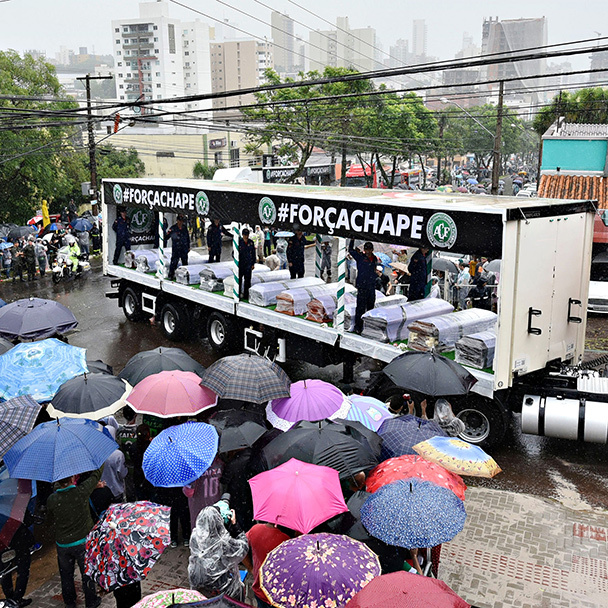 That morning, three C-130 Hercules aircraft from the Brazilian Air Force arrive in Chapecó with all the bodies. The coffins are loaded onto several open-sided box trucks, a dozen or more in each, and driven from the airport to the stadium. 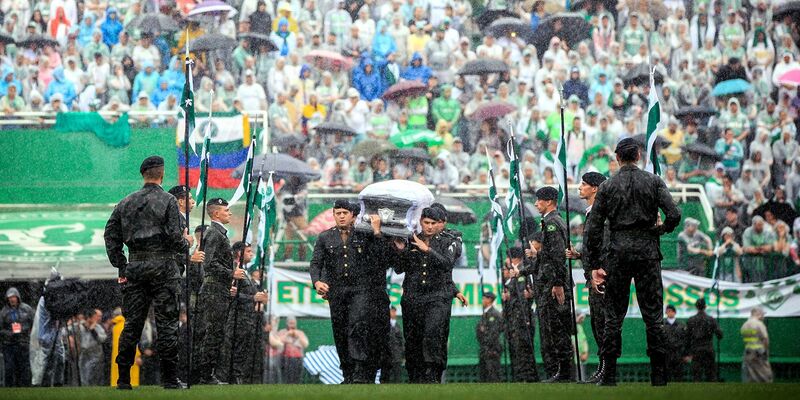 Shrouded in white and wrapped in plastic because of the rain, the coffins are carried in by the soldiers. Chiquinho and his men have set out the flowers and the bunting. They have also left only one set of goalposts on the field -- the one Danilo was guarding when he made the save against San Lorenzo that sent Chape to the final. Danilo's wife places a picture of Danilo in the goalmouth. The godfather of Danilo's son pounds the crossbar with Danilo's gloves. Under the tent, Danilo's mother hugs Filipe's father and whispers, "Why did he have to make that save in the last minute?" The president of Brazil is there. The FIFA president is there. Nearly 100,000 people, or about half the population of the city, are inside the Arena Condá or directly outside. There is coverage of the memorial all over the world. There were 77 people on the plane. Twenty-two were Chapecoense players, and three survived. Twenty-three more were coaches or team staff, and there were two team guests. There were 21 journalists, including Rafael, and there was the flight crew, all of whom perished except for one flight attendant and a maintenance technician. Of the 71 who died, there were 64 Brazilians, five Bolivians, one Venezuelan and one Paraguayan. 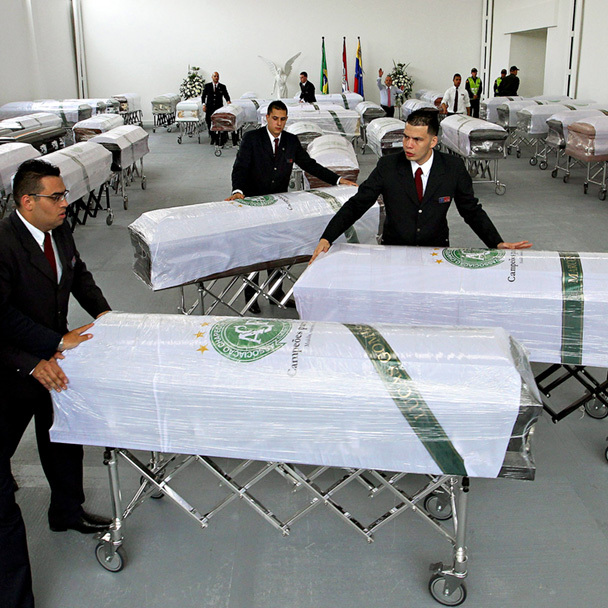 Fifty coffins come to the memorial in Chapecó; the rest are flown elsewhere for separate services. In the hospital, Rafael does not watch any of the ceremony on television. He does not see the stadium's exterior wrapped in a giant black ribbon. He does not listen to the speeches where the mayor likens the rain to God's tears. He can't bear any of it. It is too fresh. Instead, he just looks at the list, reading the names of his friends over and over. 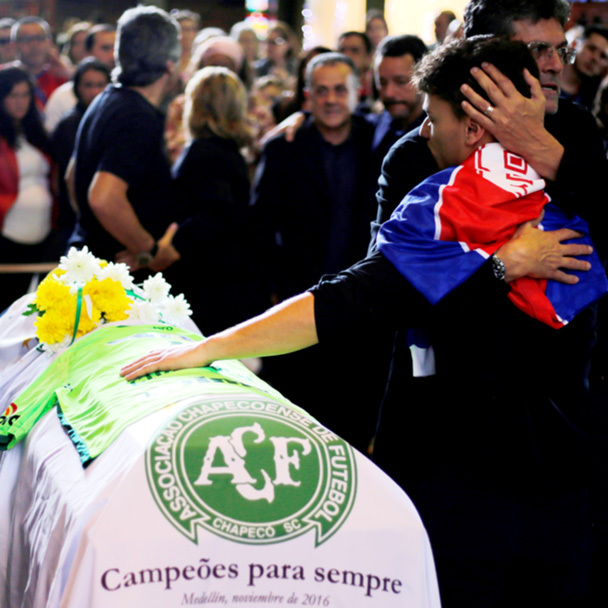 Aline Machado goes to the airport to see Filipe's coffin come off the military plane. Then, she goes to the stadium. She feels strange. She does not want to be around people from Chape, does not want to talk about how the club must be "força, força," or strong in the face of tragedy. Aline does not want to be strong. She is angry. She has so many questions, so many things that do not make sense to her. Two stand out: Why did a Brazilian team hire a Bolivian airline to take it to Colombia? And what was the pilot thinking? Filipe's father, Osmar, is mad, too. Filipe died on Osmar's birthday, and Osmar cannot stop reading news reports about LaMia and the pilot. Within days, he reads that LaMia was a twice-failed Venezuelan airline whose name was sold to Bolivian investors and relaunched in 2015. He learns it had three planes and that only one was operational. He learns the pilot, Miguel Quiroga, was in trouble with the Bolivian air force for leaving his military service early with no explanation. And he learns that Miguel Quiroga was also one of the owners of LaMia. This infuriates him. He tells Aline, "The pilot is a murderer," as he hears more and more on television and the radio. Most crashes involve a massive fire because the fuel explodes, but investigators say all the LaMia fuel gauges found in the wreckage were "below zero" so there was no fire, no explosion. The official flight plan Quiroga filed is scrutinized, and investigators believe that Quiroga might have underreported the weight of the flight. Also, the maximum flying time before fuel ran out -- 4 hours, 22 minutes -- was listed as the exact same amount of time as the expected trip time, with no safety buffer for things such as circling the arrival airport to let another plane land in front of it. Why did the plane crash? Osmar cringes when he says it: It ran out of gas. The club makes statements about how LaMia had flown other soccer teams in South America and was reputable. There was only a day or two in between winning the semifinal and leaving for the trip, it says, so the time to make decisions about the travel plans was short. The team had flown with LaMia earlier in the tournament and had been satisfied. It liked the way LaMia put Chape's logo on the plane and on the headrests of the seats. Using a charter airline was more efficient, as well, the club says, because it meant the team could leave right after the game and get back sooner than if it had to wait for a commercial flight the next day. It does not add up for Osmar or Aline, and Osmar seethes as he reads about a few other LaMia employees being questioned by Bolivian police. An investigation into the flight controller is underway, too. There is no official word from LaMia yet, but to Osmar it feels so simple: It was about money. Chape flew with LaMia, he tells his family, because it was a little bit cheaper than chartering with Gol or another Brazilian commercial airline. And Quiroga did not stop to refuel when he should have, Osmar says, because it would have taken money out of his own pocket. Quiroga tried to push it to save a little, and so Filipe is dead. Aline talks to a lawyer. There are discussions about lawsuits, about legal action. There are meetings. Some other wives and family members are interested, but many just want to move on, to try to figure out how to put their lives back together without their husband or son or brother. Aline wants to move on, too, but every time she leaves the room, Antonella tenses up. Every time she goes to the store, Antonella cries nervously. At the "Paw Patrol" birthday party, Aline will be alone. And at Filipe's farm, the locker room isn't finished, and the grass needs cutting, and the field still needs lines. Every time Aline goes there, to let Antonella run around or to simply look out over the countryside, she feels as if she is looking at a story that ends in the middle of a sentence. That is why Aline cannot just move on. And so she keeps talking to the lawyer, keeps asking questions, even though there are no answers. Whenever she tries to ask anyone at the club about what happened, she is told that all the directors at Chape who made the decision to use LaMia were on the plane. She is told that all the directors who made the decision are dead. Fifty-four days after the crash, Rafael Henzel walks back into his radio booth. It is Jan. 21, 2017, and he is wearing a light shirt and hat with a green lanyard holding his credential around his neck. His seven broken ribs are still healing, but his lungs are strong. Before he puts on his headset, he sits in his seat and pauses; he thinks of Renan Agnolin, who was next to him on the plane. There is a game today. It is a preseason match, Chape against Palmeiras, the reigning national champions, at Arena Condá. The stadium is full. Chiquinho has spent hours on the field, determined to make it a palace. It feels strange -- a new team, a new time -- but Chiquinho wants to make it nice, even if he doesn't know these players. Pitico is missing and hasn't been seen since the tragedy, and Chiquinho wonders whether it is because the dog does not recognize the new players, either. Before the match, there is a ceremony. Alan Ruschel and Neto and Follmann come out onto the field. Neto has a scar on the back of his head, his hair shaved away in a patch. Follmann is in a wheelchair, his right stump wrapped in beige dressing. He wears a black neck brace. Alan puts one hand on the back of Follmann's chair and walks gingerly, still stiff and sore after spinal surgery. The fans sing and wave paper origami flowers with the club's crest on it. The surviving players join members of their teammates' families in the middle of the field. Atlético Nacional conceded the Copa Sudamericana final to Chape, so the Chape players are now "campeões eternos" -- eternal champions. Winners' medals are draped over the necks of widows and children. Many of the wives wear their husband's jersey backward, so that the name is on the front. From his chair, Follmann lifts the trophy through tears. When Barbara, the wife of Ananias, receives his medal, she cries out and raises her hands and points with two fingers to the sky. The new players walk out of the tunnel and onto the field. Chape's board has been reconstituted, and a new president has been elected. A new coach, Vágner Mancini, has been recruited. A new front office is in place, and in six weeks the team has been reconstructed: 25 players signed, a group of coaches brought in and a support staff hired. Some teams lend players to Chape to help. Some players who played for the team earlier in their careers feel a pull to return. Túlio de Melo, a renowned forward, had played briefly for Chape in 2015 and is supposed to play for a team in Qatar in 2017. The salary is big and the destination intriguing. Then he receives a message from his friend Neto while Neto is still in the hospital after the crash. It says, "The club needs you," and Túlio de Melo comes to Chape instead. The game begins. The fans behind the goal brandish their flags as usual. It feels good to cheer. Palmeiras scores the first goal, but then Chape bends in a free kick, and the ball is nodded across the goalmouth, and Douglas Grolli, a player who grew up in Chape's youth academy and has come back to help it rebuild, nudges it over the line. There is a whoosh of energy, as if the whole stadium has welled up together. Some fans scream. Others cry. Many in the stands are wearing tiny earpieces so they can hear Rafael describe what is happening right in front of them. In his booth, Rafael's eyes go wide and he bellows, "Gooooooooooal!" He takes a breath. "My heart overflows! My heart overflows!" he shouts. 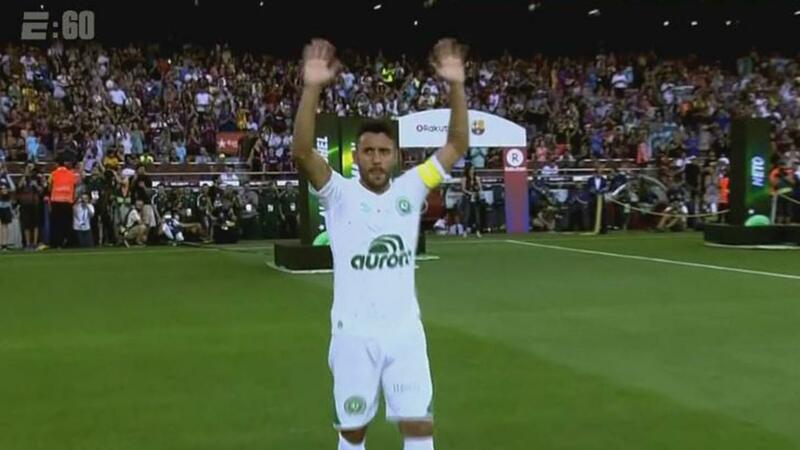 "Chapecoense! The team of our heart is reborn with a goal from its past!" Graziele takes the baby pants out of the drawer. There are tiny blue jeans, pastel slacks and striped shorts. She folds them, organizing them in different stacks. Then she puts them back in the drawer and takes out the baby shoes to evaluate. She does this every day. It is her therapy. She likes to organize the baby clothes and the baby shoes while she feels the baby kick. She likes to be in the baby's room, where there are giraffes on the wall and a soccer ball in the mobile and pictures of Tiaguinho beside the diaper-changing pad. She likes to make a mess so that she has to tidy up again. Her therapist tells her it is OK. It is OK for her to have a photo of Tiaguinho on the wall above her bed so she can feel him watching her sleep. It is OK for her to have a collage of their pictures covering the wall near the baby's room so she can feel like she is not alone. It is OK for her to believe her husband is going to be born again as her son. At the body-scan ultrasound, she sees the baby's features and is relieved. She tells her mother, "The baby has his eyes." The baby will be born in July. Tiaguinho hoped it would be born on July 22, because that was his father's birthday, and now Graziele hopes it will be then, too. She has also decided that the baby's name will be Tiago. It was so obvious; in January, her friends and family had a gender-reveal party for her, and when she cut the cake and saw that the inside was blue, everyone shouted out, "Tiago!" and threw confetti. Graziele cried. She wants to take a picture of Tiaguinho with her to the delivery room. She wants her husband to be there, too. Graziele does not love soccer. She follows Chape a little, but she lives in Bom Jardim now, her hometown about three hours northwest from Rio. She does not stay in close touch with the other Chape wives. She has her parents and Tiaguinho's parents nearby. She has Tiago in her belly. She has her pictures. She has voice messages from Tiaguinho on her phone that she listens to under the covers. Aline Machado also leaves Chapecó. Aline is in Gravataí, with Antonella. She plays "Paw Patrol" with Antonella, and, when Antonella asks about Filipe, she tells her that Filipe is in heaven. Aline says he is with Nina's daddy and Julia's daddy, so that Antonella doesn't feel as if she is the only one. Sometimes at night before bed, Antonella looks out the window and points to a star and says, "Look at Daddy." Aline's life and Graziele's life go on without Chape. So do Rosangela's and Val's and so many others. They move away because of the crash. They have to. Others stay. Chiquinho still takes care of the undersoil and the topsoil, still keeps an eye on the drainage system when it rains. After a few weeks, he and his men put away the blankets, throw away the dog food and take down the tiny house out near the shed with the rakes. Their dog, Pitico, disappeared after the crash, and Chiquinho understands. But every evening around dusk, as he rides the bus home from work, Chiquinho looks out the window anyway, craning his neck in the hope he might catch one more glimpse of Pitico, somewhere else in the city running and playing and chasing the birds that swoop low. Follmann stays, too. His neck brace is off, and he has a German prosthesis and already walks easily on it, so he doesn't need a wheelchair. He goes on a Brazilian television morning show and shows off his singing voice. He laughs, just as he did before the crash, and says he is eyeing a career as a Paralympian. He jokes it should be no problem because his iron leg never gets tired. Alan Ruschel and Neto stay as well. They rehab and train, sweating through extra work on the side during practices. They watch the new players revel in the crowds at Arena Condá, energized by the chants and the songs and the ritual, in the 71st minute of every game, when the fans shout "Vamos-vamos-Chape!" over and over, in homage to the 71 people who died in the crash. They watch the team win or tie 20 of its first 24 games, and they work harder. Marina is nervous about Alan's spine, but she goes to the games with him and watches and chants in the 71st minute, too, because she knows he is unbowed; team trainers think he might be ready to play by the middle of summer. Rafael Henzel has told Alan and Neto that he cannot wait to call their names again. Inside the team, the coaches make a decision: They do not talk about the tragedy anymore. They did for a month or so, but then they decide the locker room needs to look forward. "We need to write our own history," the new coach tells the new players, even if it is with some of the old pieces. That is why, before every home game, Chape still does concentration at Hotel Bertaso. The coaches still talk about strategy and tactics. The players still sit in the hall on the second floor, playing music and texting and filling the time until the bus leaves for the short ride to the arena. And then, as kickoff approaches, they still run out to play on the same field of those who came before them, the field that Chiquinho prepares by seeding and mowing and watering that bare patch down at the end. On Oct. 26, 2017 -- or about one month before the anniversary of the crash -- Brazilian prosecutors announced that an investigation had failed to show any evidence of "negligent or imprudent conduct" by officials from Chapecoense in the hiring of LaMia airlines, essentially absolving the club of culpability in the crash. Miguel Quiroga, who was the pilot of the plane and a co-owner of LaMia -- remains the primary target for blame by many of the victims' families, but he was killed in the crash. Five people, including Gustavo Vargas Villegas, a former Bolivian aviation official who was charged with improperly using his influence to help with LaMia's certification, as well as his father, Gustavo Vargas Gamboa, who was LaMia's general director, faced criminal charges in the aftermath of the crash. Gamboa, who is in poor health, pleaded guilty to one of the charges against him in hopes of receiving leniency; he awaits sentencing. A full report on the crash by the Colombian aviation authority has yet to be released. A preliminary report said it was clear that "human error" caused the crash and noted a number of irregularities with the flight, most notably its illegal flight plan, which called for a trip beyond the plane's allowable distance range as well as a cruising altitude that was prohibited. The complete analysis -- which should have more declarative conclusions about what happened and what could have been done to prevent it -- was supposed to be published in April but has been delayed several times. It is now expected to be made public in the first week of December but could be delayed again. For the individuals connected to the crash, as well as the club itself, the past year has been about trying to move on. The newly constituted Chapecoense team won its state championship this past spring but struggled in the national league's top division. After a late-season surge, however, it ensured it would avoid relegation earlier this month -- and celebrated in a familiar fashion. Aline Machado, wife of Filipe, still lives near her family in Gravatai, and is raising her daughter as a single mother. Antonella will turn 4 in January. Filipe Machado's backpack was found at the crash site and was only recently returned to Aline and Antonella by Colombian authorities. Inside was Filipe's wallet, toothbrush, shaving kit and the "Paw Patrol" stuffed dog that Antonella had given Filipe to take with him on his trips. Among the survivors, Neto is continuing to rehabilitate his injuries and still hopes to play again. Alan Ruschel returned to the field this past summer. He captained Chape in an exhibition against Barcelona at the famed Camp Nou stadium and, after the match, exchanged jerseys with Lionel Messi. He has played in a handful of matches this season and scored one emotional goal in a friendly against Roma. Jackson Follmann, who had his leg amputated after the crash, has become an ambassador for Chapecoense and has even participated in practice with his prosthesis. He married his longtime girlfriend, Andressa, in October. Neto and Ruschel were his best men. Rafael Henzel, the radio announcer, continues to be the team's primary match commentator. He has written a well-received book, "Viva Como Se Estivesse de Partida," which translates roughly to "Live As If You Are Going to Die Tomorrow." He has also become a motivational speaker. Chiquinho has remained the team's groundskeeper, and he still has trouble with the bare patch of grass near one end of the field. Pitico, the injured dog that Chiquinho and his crew adopted, never returned after going missing following the crash. And finally, at 9:25 a.m. on July 19, 2017, Graziele gave birth to the baby boy who Tiaguinho learned was in her belly only a week before the crash. The baby weighed just over 8 pounds and was 19 inches long. After delivery, Graziele asked to be alone in the room with only a picture of Tiaguinho and their son so that they could experience becoming parents together. Graziele named the boy Tiago -- he has his father's eyes -- and she plans to raise him in Bom Jardim. There, he will go to the same school at which his mother and father first met.